This interview was originally posted on Japanator. Japanator: How was the show? Did you get a chance to meet with any of the fans? 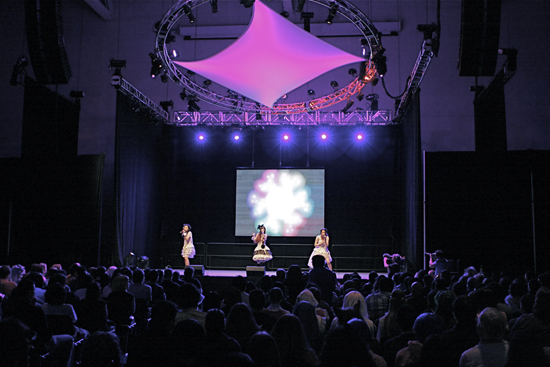 Kalafina: We were very happy to see all the warm audience, even though it was our first time performing in the U.S.! And we were also happy to meet our fans through the autograph session! Jtor: You have a very distinctive style, both in your videos and live performances. Is there any story behind the costumes and environments you choose? Where does your visual inspiration come from? Yuki Kajiura: Yes, since The Garden of Sinners is originally a novel, there is definitely a story behind each song inspired from the book. With Kalafina’s music, I put a lot of focus in expressing their world-view. There’s always a picture in my head in each song, and I try to reflect that image into my music. In terms of their fashion, there’s a classical, Medieval European influence, which is referred to “Gothic” in Japan. However, I’ve been recently leaving it up to them with their fashion, so a lot of the inspiration is actually coming from them individually. 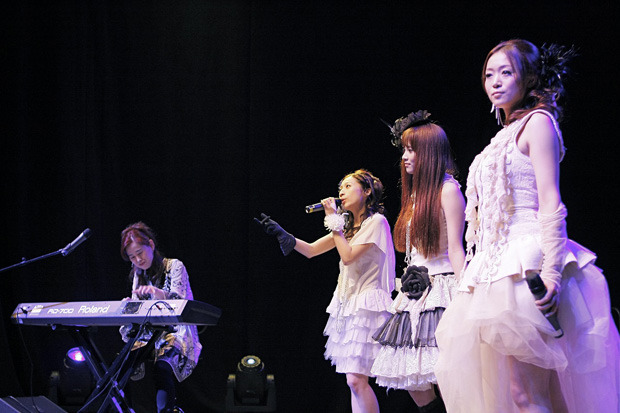 Jtor: Kalafina’s music and outfits are often very whimsical, and remind me of stories and fairytales. What is your favorite fairytale? Hikaru: Anything with a “Princess”. However, I don’t really like the sad endings…. Y.K. : “The red candle and the mermaid”. It’s a Japanese fairytale. Many of the western fairytales have a dark touch, but it’s the same for Japanese fairytales as well. Often even heavier…This is another story that has a sad ending, but it’s about this red candle sinking in the ocean, and it’s got such a beautiful color. I remember composing a song inspired by this book when I was a kid (laughs). Jtor: What’s the meaning behind the name Kalafina? Y.K. : There isn’t any meaning, really. It’s a coined word. Jtor: Do you prefer to work behind the scenes and not on stage, or would you enjoy being more in-front and in the spotlight? Y.K. : I like performing on stage occasionally, but I generally prefer working behind the scenes. It’s just more fun for me. Jtor: You work for so many different projects. How do you mange to keep them all going at once? What is you creative process like when writing for many different styles and groups? Y.K. : I try not to work with 2 different projects simultaneously. It’s very difficult to switch my mind when there’s more than one project going on. So if I had to work on 2 different things in 2 weeks, I would completely separate them by each week. Jtor: Are there any artists/composers that in particular the inspire you? Y.K. : Not really… But I do respect all the composers out there. Jtor: What was it like to find out that you would be a part of this amazing group under Yuki Kajiura, and how did you find out? Keiko: I first met Kajiura-san about 3 years before starting Kalafina, and I had an impression that she’s a person of few words, and that she’s very calm, but I could also sense her passion towards music. With the fact that I didn’t have any classical experience at the time, I was worried that I could really express and understand her world-view. I was able to absorb it through the process and now I feel comfortable, but I was nervous at the time. Hikaru: I was actually now really aware of her work at the beginning… But when I found out that I’ll be part of Kalafina (through the audition), I did a little research on the internet to find out what kind of music Kajiura-san has done in the past. I found out that I actually recognized a lot of them! I just didn’t know that it was Kajiura-san’s work. So I was just surprised to be able to work with someone like her, but I felt worried and pressured at the same time. Wakana: When Kalafina was first formed, I knew nothing about the details. The name “Kalafina” didn’t exist at that time, and I didn’t even know how many people auditioned. I actually went over to the audition with Keiko, and as a result, we were both selected. That’s when I realized that this isn’t a solo project, but rather a group project. I was excited and also curious to be part of Kajiura-san’s new project, since I really didn’t know what my role was with this project. Like, am I really going to sing? Or is it more of a background singing like with FictionJunction?… But now I know! Jtor: So, what is it like to work with Yuki Kajiura? Kalafina: There’s always a good tension when working with Kajiura-san. She’s like a teacher for us, and we’re learning so much from her. There’s a mixture feeling of fun & nervous. Jtor: What approach did you as singers take in order to bring to the music as much as you can? How much direction do you get before you perform your parts? Kalafina: Before our performance we would try to put the whole set-up in our mind and imagine. Then we would actually adapt that image, and add more ideas through our rehearsals. Jtor: How do you take care of your voice, especially when cold season comes around? Keiko: Before the show, I usually put a mask when going to sleep to protect my throat. And I’ll also keep the room humidity at 60%, and not eat anything spicy. Hikaru: Yes, including carbonated drinks. I try to avoid anything that could potentially damage the throat. Wakana: Salt water gargle for me. I never get sick! Jtor: Your song “Sprinter” seems to fit perfectly with describing the story of the fifth Kara no Kyoukai movie. Was this something you were aiming for when writing the song, or did it happen as an afterthought? Y.K. : Yes, all of the theme songs from Kara no Kyoukai are inspired from the original novel. I try to express those stories through my music. Jtor: How do you get inspiration for (or come up with) the lyrics and background voice parts, especially the ones that do not contain actual words but rather their own melody? Y.K. : With the theme songs, the lyrics are coming from the original work. Whether if it’s a novel, anime, film, or a script, I’ll try to really understand its world view and rewrite that story through my music. With the other projects, I would draw a picture in my head, and try to pull out the lyrics from that image. The coined words (known as Kajiura-word) are actually very easy to come up with. It takes time for me to write real lyrics, but I could go on and on with the coined words. Jtor: What music do you listen to outside of Kalafina, and what are some of your favorite bands and musicians? Keiko: Amuro Namie & Yutaka Ozaki. Y.K. : Radiohead, and I’m currently listening to Asian Dub Foundation. Jtor: What do you expect to see at an American anime con? Do you perform at similar anime conventions in Japan, or do you perform your own shows outside of the anime world? 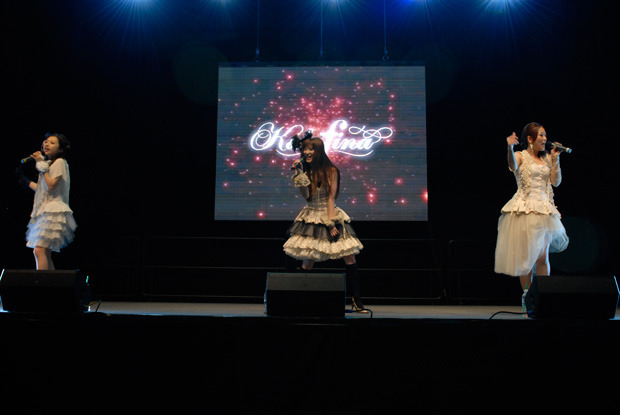 Kalafina: This is our first time to perform at an anime convention. There are some anime conventions in Japan too, but it has a completely different vibe. Jtor: What will happen to Kalafina when the Kara no Kyoukai series is over? Y.K. : Kalafina started with the anime connection, and writing theme songs for anime film is definitely fun, but I think Kalafina is staring to enter its path simply as a music group. I hope to keep continuing our “Kalafina Style” music. Jtor: Do any of you have any other projects planned for the future? Kalafina: We’ll be performing more this summer in Japan, and we’ll be releasing our new single in July! Thank you for all your support and we hope to come back again to America!